How long have you been knitting or crocheting? I learned both when I was quite young, probably about five. I took to crochet and did a lot of that. Then several years ago I wanted to knit a scarf, so I bought some needles and took off! Next I fell in love with knitting felted bags, and now I'm just plain hooked!! How did you learn? or from whom? My grandma taught me. What was your first felted object, and why did you decide to try felting? 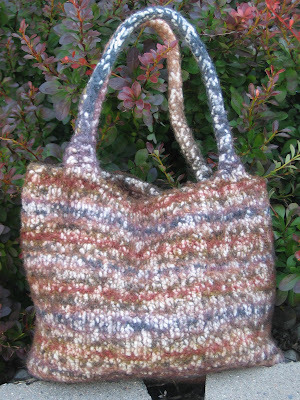 The tab top tote from the book Felted Knits by Beverly Galeskas. It just looked like fun to me! What are your favorite colors? Any you hate? I love rich, saturated colors; especially in shades that tend to be a little "off" from the true color. I love shades of teal, navy, and wine. Also neutrals such as mocha, gray, cream and black. I'm not fond of primary brights, neons, or pastels. What are your favorite styles\types of bags? (Long straps? Short handles? Handbags? Totes? Embellished? Plain? Include links to patterns or photos if you’d like – give your pal an idea of what you enjoy!) I tend to like bags that are more structured rather than loose and floppy. I like to be able to organize my things and find them! I guess I tend to lean toward short handles, but also like long straps. My handbags tend to be meduim in size. As far as a tote goes, any size will do! I'm okay with tasteful, artsy embellishments. I don't do "Cute". What handbag or bag are you carrying today? You're lookin' at it!! Do you use a separate bag to carry your knitting? Yes, I do. I have this "thing" about designating a specific bag for my projects! What other things do you enjoy knitting or crocheting? I'm just now making my first pair of socks, and am having a great time with that. I also have several shawls/wraps that I'm anxious to get started on, two of which are lace, which will be new for me. And dishcloths, of course! They're always fun and provide quick results! What sort of needles do you enjoy working with? (straights vs circs, bamboo vs aluminum) I'm still trying different needles as I add to my supply. I use both straights and circs. I like bamboo, and recently tried addi turbos and lenjoyed them very much. What’s one project you’ve not yet tried but are dying to make? I guess that would be the lace shawls that I mentioned earlier. The one I'm looking to do first is the Forest Canopy Shawl, which is written specifically for knitters just starting out in lace. Oh, I also want to learn to knit a mobius, and want to make a couple of mobius bowls. What’s one yarn you’ve not yet tried but are dying to work with? Hand Maiden Sea Silk. What other hobbies do you have? I bead--both stringing and beadweaving. Do you spin? No. Sew? I can, but rarely do. Just the occasional lining for one of my bags!! :o) Garden? Do planters on my patio count? I love having containers full of many types of foliage along with some flowers. As far as "in the ground", I don't do much of that anymore. Besides yarn, do you collect anything? What makes you think I collect yarn?? Teehee! And beads! What kind of goodies do you enjoy? When it comes to goodies, I'm easy to please! Sweets? Oh, yes! I like most sweets. Just not fond of really sour and/or fruity things. I like chocolate (milk and white), gummies, Jelly Bellys, etc. Salty? Salty is great, too! Love almonds and cashews. Anything you hate or are allergic to? No. Do you have any kiddos? (Furry kind count!) My husband and I have three grown sons, ages 25, 21, and 20. (The two youngest are exactly 2 weeks apart in age. One just turned 21 and the other one will in 9 days! Can you figure that one out?!?) We're fortunate to have one of the boys still living at home! What kind of project best personifies you and why? Hmmm. . . I guess I'm going to go with a felted handbag. (Imagine that!!) One that's unique and has artsy details. Why? Because I like unique things, and I tend to be artsy and pay attention to detail. I have no problem with fussing over something to get it to turn out the way I want it to. That being said, I'm also practical (like a handbag needs to be!) and I like to be organized (like a handbag needs to be!!) What is your favorite part of autumn? You can also share a special Autumn memory if you'd prefer! I like the crispness in the air and the vivid colors. My grandma used the phrase "October's Bright Blue Weather" to refer to the intense blue of the sky that we sometimes see in the fall. Each year when I see that bright blue sky, it reminds me of grandma!! 1. I'd pay off the house, the boys' educations, and the rest of our bills. 3. I'd share with my church, several charities, and also individuals who have needs. I'm LOL at "I have this "thing" about designating a specific bag for my projects!" - me too, after all it means we can sort of give a reason of WHY we have or buy so many bags, right??!! haha. I have a thing for taking a big giant bag and dumping everything in it at once - I need to have a 'bag for each thing' thing! cool bag--I love the colors in it! Oh how I wish I had time to join the Felted Bag exchange--it looks like such a cool swap! 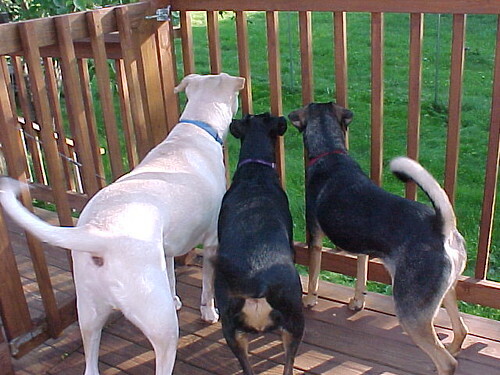 Hey - thanks for stopping by my blog! I'm really excited to get to know people through the fall bag exchange! I totally agree about the bag things! I've gotten to the point where each project has its own bg. I'd never get anything done if I didn't sort it all out. I'd forget what yarn was for which project! I'm excited about the felted bag swap! hi from another member of the FFBE! Your dogs are nice! I had a boxer growing up, his name was Kayo (K.O.) for knock out! My parents were creative with our pet's names. Wanted to stop by and say Hi! I'm your secret pal in the FFBE! Great blog! I'll stop by again and also email you soon. It's fun to hear from you! I'm looking forward to this exchange!